In an unfortunate setback for worker justice at Catholic institutions, Catholic Cemeteries of San Antonio has moved to strip cemetery workers of their union rights. The cemetery workers had been represented by the CWA for more than a decade when the union received a letter from the Catholic Cemeteries administrator Fr. Martin Leopold stating that they would no longer recognize the union after the current contract expired June 30. Fr. Leopold’s letter made no attempt to reconcile the action with Catholic social teaching. It did, however, advise the employees they had no legal recourse, arguing that the First Amendment puts Catholic Cemeteries beyond the reach of U.S. law. The union is pursuing an appeal before the National Labor Relations Board. Martin Luther King (1929-1968), one of our country’s foremost leaders in race relations, is less remembered for his advocacy of the dignity of work. In February 1968 two Memphis garbage workers died, crushed in a compactor. Their fellow workers caucused; lamented their low pay; detailed their unsafe work conditions; discussed joining AFSCME, a union; and called for a strike. As the days passed, threats and confusion dominated the Memphis scene. King went there on March 18th to support the workers. He returned on March 28th for the same purpose. This time violent young adults roamed the streets. A curfew was imposed. King retreated to Atlanta and then to Washington. King’s advisors discouraged further involvement in the Memphis situation, but he returned there. It is the lesson of the Good Samaritan parable, he said. “If I do not stop to help the sanitation workers,” I am like those who passed by. Aware of threats against him, he preached: “But it doesn’t matter to me now… I may not get there with you… [But] we as a people will get to the promised land.” On April 4, 1968 King was murdered in Memphis. The city reached a settlement with the workers on April 16th. Some details were hastily left incomplete, specifically about retirement. Thus all these years later, the 14 living workers who participated in the 1968 strike get $50,000 toward retirement. Back during the 2001 New York City mayoral campaign, candidate Michael Bloomberg made what the press treated as a major gaffe: “Being a sanitation worker in this day and age is more dangerous than being a policeman or fireman.” His point could have been better made, but Bloomberg was correct—more injuries, more deaths. Garbage collectors fall from trucks, get hit by traffic, get cut by objects in bags, get injured or killed as they repair or clean equipment. Robin Nagle was a driver for a 35-ton New York City garbage truck that she nicknamed Mona. Pedestrians obliviously walk in front of and behind Mona, she writes in Picking Up (Farrar, Straus, 2013). Residents think nothing of throwing out all manner of hazardous material. Plus the complaints. These days health care delivery is a major topic. What two occupations most contribute to the delivery of our health? Plumber and garbage collector. Droel edits INITIATIVES (PO Box 291102, Chicago, IL 60629), a newsletter about faith and work. 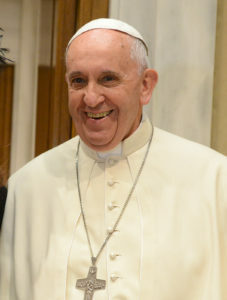 On June 28, Pope Francis addressed Italy’s CISL/Confederation of Trade Unions, an umbrella organization of labor unions much like America’s AFL-CIO. The pope had much to share, especially for those of us called to pursue justice in the labor movement. The Holy Father observed that today’s market economy is anti-union precisely because it has cast off ethical and social responsibilities. The capitalism of our time does not understand the value of the labor union, because it has forgotten the social nature of the economy, of the company. This is one of the greatest sins. Market economy: no. We say social market economy, as Saint John Paul II taught us. Breakthrough for Worker Justice at Fordham U. The big news in Catholic employment relations this month: Fordham University President Joseph McShane, SJ announced that out of respect for Catholic social teaching on the rights of workers the university would not oppose their adjuncts if they wished to form a union and bargain collectively. 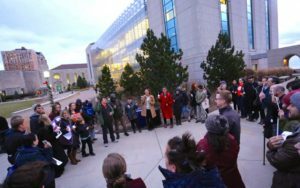 Adjunct faculty at universities across the United States, Catholic and secular, have sought to form unions in recent years to remedy low pay, poor benefits, and job insecurity. Some Catholic universities, such as Georgetown and Trinity Washington, have adopted a neutral stance, leaving the decision to the workers themselves – a stance conforming with Church teaching on the right of workers to join trade unions. Others, however, such as nearby Manhattan College, have refused to recognize and bargain with adjunct unions – and then invoked First Amendment protections to escape legal consequences, seeking to associate “union avoidance” practices with the preservation of religious freedom. After much consultation and reflection, I have decided that the University will not oppose the unionization of adjunct faculty. As you receive this email, we have initiated discussion with the union over the University adopting a stance of neutrality regarding the organization of our adjunct faculty. I have become convinced of the rightness of this course of action over the last few months by conversations with my fellow Jesuits. After all, organized labor has deep roots in Catholic social justice teachings. And though this is an issue that many universities are facing—not all of which have come to the same decision—given its Jesuit traditions and historic connection to first-generation and working-class students, Fordham has a special duty in this area. (The complete text of the email can be found online courtesy of Georgetown’s Kalmanovitz Initiative.) 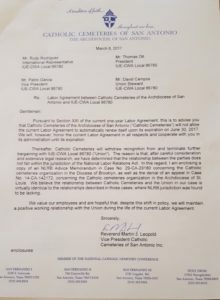 We at the Catholic Labor Network applaud Fr. McShane and the Fordham administration on this important decision, and the witness it offers to Catholic business leaders nationwide. We fervently hope and pray that this begins a new chapter in labor relations at the university, one of mutual respect and cooperation for the common good. In other news: The NLRB has announced that Manhattan University adjunct faculty voted 59-46 for union representation! Well, it may not be “news” news – the faculty voted in 2011, but the Manhattan administration’s legal arguments kept the ballots impounded for six years. Now that Manhattan knows that its adjunct instructors want union representation, will they honor their employees’ choice? Perhaps the vote results, and events at Fordham, will provide the Manhattan administration aids to discernment as well. http://catholiclabor.org/wp-content/uploads/2015/10/CLN-logo_565x100.jpg 0 0 Clayton Sinyai http://catholiclabor.org/wp-content/uploads/2015/10/CLN-logo_565x100.jpg Clayton Sinyai2017-06-14 19:42:312017-06-14 19:42:56Breakthrough for Worker Justice at Fordham U. In the wake of a headline-making scuffle between legislators, the whole nation has learned about “SB4,” the Texas legislation targeting “sanctuary cities.” But the Texas Catholic Conference and the Texas AFL-CIO have been fighting the proposal for months. SB4 would prohibit “sanctuary” policies adopted by police departments in cities across the Lone Star State to win trust and cooperation in immigrant communities. They assured even the undocumented that the police were there to fight crime, not enforce federal immigration laws. “Your sad story doesn’t obligate me or anybody else to pay for somebody else’s health care,” says a former Congressman from Illinois. He has apparently forgotten the definition of insurance (a hedge or cushion against risk), which is normally achieved by spreading the cost of a problem (a car accident, a fire, a surgery) among a more-or-less random pool of people. More importantly, this former legislator (now a radio commentator) and many others like him have forgotten an crucial part of moral philosophy. Our United States culture prizes liberty. It is marvel the way our country’s founders and its citizens to this day have woven liberty into our laws, our civic affairs, our business practices, our expressions of faith and more. This is something new in the long history of civilization. We correctly invoke the virtue of liberty or freedom at sports events, in schools, in discussions of military deployment, in TV commercials, in policy debates and more. Frequently, however, we forget that liberty is a social virtue and that it is part of a constellation of other virtues. Instead, we too often equate liberty with ragged individualism. Individualism is now the default position of our culture. It says that goodness is achieved when at the end of the day (or the end of the financial quarter or fiscal year) the greatest number of people gets the best results possible. The mechanism is individual choice. The maximum number of choices, says individualism, will somehow yield maximum benefits—though not for all people, but for the most people. This is a philosophy for lazy thinkers. It reduces liberty or freedom to choices or options. Should we install a dish or connect with cable? Should we marry or simply live together? Should we help one another with health insurance or allocate for our own family exclusively? Individual liberty is an achievement, but individualism, particularly as currently presented by some ideologues in our society, is destructive. Yes to communitarian individuals; no to extreme individualism. The principle of the common good recognizes that many important things cannot be obtained by individuals. Many good things can only be obtained in common: public safety, effective fire-fighting in urban areas, roads and airports, libraries (including all cyber-research), clean water and access to health care. No matter how wealthy the former Congressman might be, he cannot have all these good things unless he cooperates. In fact, many people never use an airport but their taxes subsidize the airport that the Congressman uses. Many never go to college, but taxpayers underwrote his education. His tuition did not fully cover the costs of running those schools. The common good, which was always part of the United States experiment in democracy, complements the so-called free market and in fact it makes the market better. The common good is not reducible to the sum total of individual choices. It imposes considerations on those who are expressing an opinion and acting on a calculated choice. If we forget about the common good, we sooner or later lose society. Of course, the common good does not give wholesale endorsement to the Affordable Care Act. It does not endorse Trump/Ryan Care. Reasonable citizens can reasonably differ about the delivery of health care. In fact, the common good does not even necessitate a health insurance system. Theoretically, normal health care (the requirement of the common good principle) could be inexpensively available to all if pharmaceutical executives, doctors, hospital administrators and others were paid the same wage as their patients. Here again, he and many others don’t realize that compassion or love is a commandment or a requirement. It is not merely optional. Likewise, he forgets to put compassion into the constellation of social virtues. For example, distributive justice is the virtue that obligates an authority, like the government, to allocate resources so that all have the common goods. Extreme individualism is bad for our culture, bad for business, bad for United States image abroad and bad for legitimate debate about government meddling in health care, about tax incentives for domestic job creation, about improvements in education outcomes, about women’s reproductive health, about enforcing the civil rights of gays and lesbians, about reform inside civil service unions, about extraction and use of domestic natural resources. Extreme libertarians on the right and on the left are hurting our society. Droel edits INITIATIVES (PO Box 291102, Chicago, IL 60629), a print newsletter about faith and work. America’s official Labor Day falls in September, but the world’s Labor Day is May 1. That includes the Church, which celebrates this day as the Feast of St. Joseph the Worker. This year’s Mayday is shaping up to be an especially active one, because immigrant workers have organized a day of walkouts, rallies and demonstrations to respond to recent executive actions targeting immigrants. The AFL-CIO and several national and local labor organizations have endorsed this action and provided critical support. How are you celebrating the Feast of St. Joseph the Worker? Share your plans in the comment section below! We are pleased to report that Loyola University Chicago has established a Just Employment Task Force to examine university labor and employment practices in light of Catholic Social Teaching! Loyola has witnessed a number of labor disputes in recent years. Food service workers there, who belong to UNITE HERE and are employed by a university contractor, tangled with their employer over health benefits. Loyola’s adjunct faculty (right) voted to join the SEIU and are in the process of negotiating their first contract. And last month graduate teaching assistants voted to join the SEIU as well. 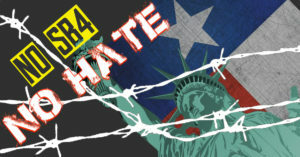 http://catholiclabor.org/wp-content/uploads/2015/10/CLN-logo_565x100.jpg 0 0 Clayton Sinyai http://catholiclabor.org/wp-content/uploads/2015/10/CLN-logo_565x100.jpg Clayton Sinyai2017-03-14 14:43:072017-05-13 16:31:34Loyola University Chicago Appoints "Just Employment Task Force"